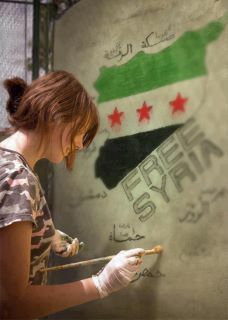 It´s my birthday and I have the same birthday wish I´ve had all my life: A Free Syria. Since it seems like this may take a while, I´ve come up with a smaller birthday wish: To collect money and send it to Syria at these extremely difficult times. To use my birthday to start my own fundraising for Syria. On Monday, October 15, I´ll check the account and will transfer the money to different friends who live in Syria. They will make sure this reaches people in their communities, people who are in real need in Aleppo, Hama, Homs, and the rest of the country. If you prefer to make your donation to my friends directly, you can contact me individually and I will give you my friends´ account numbers. However, since their situation is quite unstable and unpredictable I think it´s safer this way. Once they receive the money I will write another post to keep you updated on where it goes. How does this sound? So yalla, make your donation and make my day! Love. – And Free Syria.